Institute of Technology Associate Professor / Assistant Professor / Professor posts. Retired persons below the age of 65 years may also apply for appointment as Adjunct/Contract Professors. For these jobs can apply on or before 27-04-2019. More Information can refer the official website http://www.cbit.ac.in. Remaining details like Salary, Important Dates, Available Vacancies, Qualification, How to Apply, College Address are maintained given below. Chaitanya Bharathi Institute of Technology, Hyderabad. 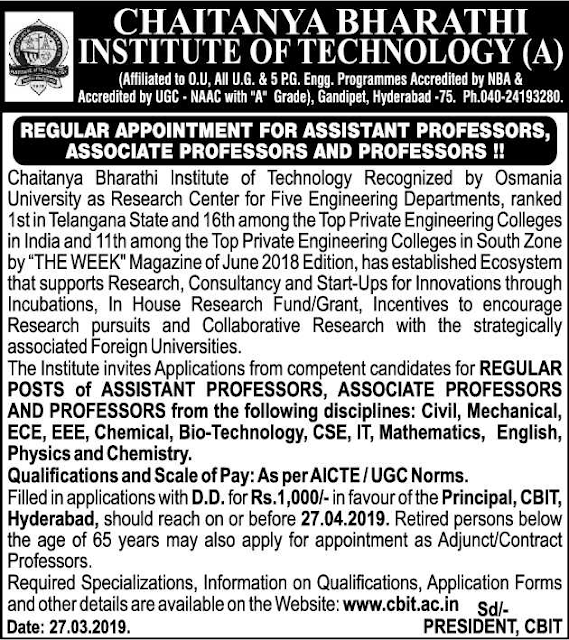 Starting Date to apply for CBIT Associate Professor / Assistant Professor / Professor Jobs: 27-03-2019. 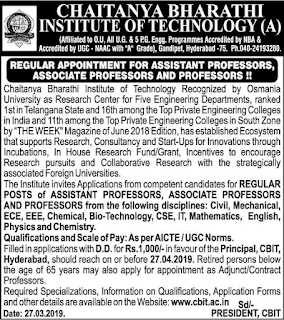 Ending Date to apply for CBIT Associate Professor / Assistant Professor / Professor Jobs: 27-04-2019. Interested and Eligible candidates can send filled in application with D.D for 1000/- in favour of the principal, to college address given below. Last date to apply date is 27-04-2019.